The SURFACE ONLY of those certain tracts or parcels of land with the buildings and improvements thereon, and the easements and appurtenances thereunto belonging, containing an aggregate 1,079.05 acres, more or less, situate in Harvey District, Mingo County, West Virginia, more particularly described in a deed of record in the Office of the Clerk of the County Commission of Mingo County, West Virginia, in Deed Book 404 at page 457, and shown on Tax Map 125, as Parcels 7, 8, 10 and 11,and Tax Map 145, as Parcel 2. The MINERALS ONLY of the described aggregate 1106.05 more or less acres are contained in Tax Map 125, as Parcels 8 and 11 for about 651.85 acres in Fee. 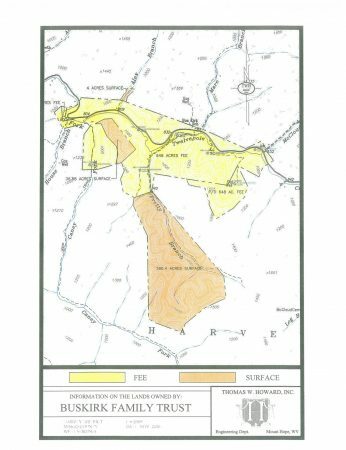 Fifty (50%) interest in the gas and oil on 615 (O & G) acres more or less situate in Tug River District, Mingo County, West Virginia designated as Tax Map 9999, as Parcel 10.1. Twelvepole Creek rises in northern Mingo County before flowing north through Wayne County. Twelvepole Creek flows eighty-three miles from Mingo County, West Virginia, to the Ohio River. It has a long and rich history and has played a pivotal role in the region’s economy and transportation. Native Americans had previously lived in the Twelvepole Valley for thousands of years. When Europeans settled in the area, they used the large creek for a variety of purposes. The creek was dammed and grist mills were erected along its banks. Prior to the construction of the railroad, people used the creek as a primary mode of transportation. Coal and timber was floated down the river to the Ohio River to reach outside markets. Today, thanks to two large dams constructed by the U.S. Army Corps of Engineers in the 1970s, the waters of Twelvepole Creek offer visitors various recreational opportunities. Twelvepole Creek received its name from early explorers, the group supposedly included a young George Washington. Traveling the Ohio River, they measured the mouth of the creek where it joined the Ohio in terms of poles, also known as rods. Being approximately 198 feet (12 poles) wide at its mouth, the creek was named Twelvepole Creek. Mingo County is the newest county in the state, formed by an act of the state legislature in 1895 from parts of Logan County. It lies on the Tug Fork between McDowell and Wayne counties, with a territory of 423.9 square miles. It is also bordered by Wyoming, Logan, and Lincoln counties, and by Pike County, Kentucky, and Buchanan County, Virginia. Mingo County lies in the heart of Appalachia. It is named for the Mingo Indians, for whose best-known chief, Logan, the mother county was named. Mingo County was created after the population of the Tug Valley boomed with the construction of the Norfolk & Western Railway through the region. Williamson is the county seat. Other principal towns include Delbarton, Matewan, and Gilbert. Mingo County is drained by the Tug Fork and the Guyandotte River and their tributaries, and the headwaters of Twelvepole Creek. The county is served by U.S. 119 (Appalachian Corridor G), U.S. 52, and several state and county routes, and by the Norfolk Southern Railroad, the successor to the N&W. Mingo County was still part of Logan County when the infamous Hatfield-McCoy Feud occurred. Most of the Hatfields resided in what became Mingo County, where they farmed and timbered and were politically active, and many of the feud’s key events took place within the present county. The main part of the feud began in 1882. A total of 13 people were killed as the conflict continued into the 1890s. Several Hatfield partisans were jailed, and one, Ellison “Cottontop” Mounts, was hanged in Kentucky. The vendetta died down after that. It became notorious due to the sensational publicity given it by the regional and national press. The tourism industry is emerging. Important developments include the Hatfield-McCoy Trail and the Williamson Area Railroad Museum. Additional tourism projects include the annual Hatfield-McCoy Reunion and Marathon, the King Coal Festival, and the preservation of Matewan as a national historic district. The completion of four-lane Appalachian Corridor G (U.S. 119) has opened the county to visitors from north and south.